Punch, or The London Charivari was a British weekly magazine of humour and satire established in 1841 by Henry Mayhew and engraver Ebenezer Landells. Historically, it was most influential in the 1840s and 1850s, when it helped to coin the term "cartoon" in its modern sense as a humorous illustration. Punch was founded on 17 July 1841 by Henry Mayhew and engraver Ebenezer Landells, on an initial investment of £25. It was jointly edited by Mayhew and Mark Lemon. 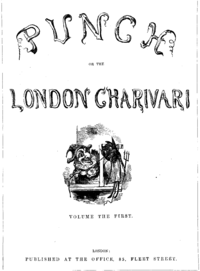 It was subtitled The London Charivari in homage to Charles Philipon's French satirical humour magazine Le Charivari. Reflecting their satiric and humorous intent, the two editors took for their name and masthead the anarchic glove puppet, Mr. Punch, of Punch and Judy; the name also referred to a joke made early on about one of the magazine's first editors, Lemon, that "punch is nothing without lemon". Mayhew ceased to be joint editor in 1842 and became "suggestor in chief" until he severed his connection in 1845. The magazine initially struggled for readers, except for an 1842 "Almanack" issue which shocked its creators by selling 90,000 copies. In December 1842 due to financial difficulties the magazine was sold to Bradbury and Evans, both printers and publishers. Bradbury and Evans capitalised on newly evolving mass printing technologies and also were the publishers for Charles Dickens and William Makepeace Thackeray. The term "cartoon" to refer to comic drawings was first used in Punch in 1843, when the Houses of Parliament were to be decorated with murals, and "cartoons" for the mural were displayed for the public; the term "cartoon" then meant a finished preliminary sketch on a large piece of cardboard, or cartone in Italian. Punch humorously appropriated the term to refer to its political cartoons, and the popularity of the Punch cartoons led to the term's widespread use. The illustrator Archibald Henning designed the cover of the magazine's first issues. The cover design varied in the early years, though Richard Doyle designed what became the magazine's masthead in 1849. Artists who published in Punch during the 1840s and 50s included John Leech, Richard Doyle, John Tenniel and Charles Keene. This group became known as "The Punch Brotherhood", which also included Charles Dickens who joined Bradbury and Evans after leaving Chapman and Hall in 1843. Punch authors and artists also contributed to another Bradbury and Evans literary magazine called Once A Week (est.1859), created in response to Dickens' departure from Household Words. In the 1860s and 1870s, conservative Punch faced competition from upstart liberal journal Fun, but after about 1874, Fun's fortunes faded. At Evans's café in London, the two journals had "Round tables" in competition with each other. 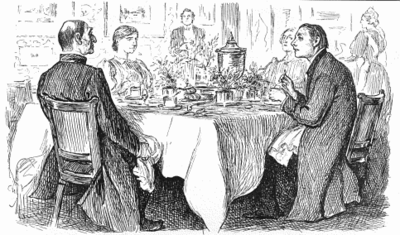 "True Humility": Bishop: "I'm afraid you've got a bad egg, Mr Jones"; Curate: "Oh, no, my Lord, I assure you that parts of it are excellent!" After months of financial difficulty and lack of market success, Punch became a staple for British drawing rooms because of its sophisticated humour and absence of offensive material, especially when viewed against the satirical press of the time. The Times and the Sunday paper News of the World used small pieces from Punch as column fillers, giving the magazine free publicity and indirectly granting a degree of respectability, a privilege not enjoyed by any other comic publication. Punch would share a friendly relationship with not only The Times but journals aimed at intellectual audiences such as the Westminster Review, which published a fifty-three page illustrated article on Punch's first two volumes. Historian Richard Altick writes that "To judge from the number of references to it in the private letters and memoirs of the 1840s...Punch had become a household word within a year or two of its founding, beginning in the middle class and soon reaching the pinnacle of society, royalty itself". Increasing in readership and popularity throughout the remainder of the 1840s and 1850s, Punch was the success story of a threepenny weekly paper that had become one of the most talked-about and enjoyed periodicals. Punch enjoyed an audience including Elizabeth Barrett, Robert Browning, Thomas Carlyle, Edward FitzGerald, Charlotte Brontë, Queen Victoria, Prince Albert, Ralph Waldo Emerson, Emily Dickinson, Herman Melville, Henry Wadsworth Longfellow, and James Russell Lowell. Punch gave several phrases to the English language, including The Crystal Palace, and the "Curate's egg" (first seen in an 1895 cartoon). Several British humour classics were first serialised in Punch, such as the Diary of a Nobody and 1066 and All That. Towards the end of the nineteenth century, the artistic roster included Harry Furniss, Linley Sambourne, Francis Carruthers Gould, and Phil May. Among the outstanding cartoonists of the following century were Bernard Partridge, H. M. Bateman, Bernard Hollowood who also edited the magazine from 1957 to 1968, Kenneth Mahood and Norman Thelwell. Circulation broke the 100,000 mark around 1910, and peaked in 1947–1948 at 175,000 to 184,000. Sales declined steadily thereafter; ultimately, the magazine was forced to close in 1992 after 150 years of publication. Punch was widely emulated worldwide and popular in the colonies. However, the colonial experience, especially in India, also influenced Punch and its iconography. 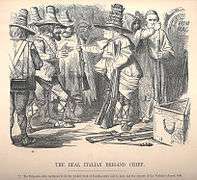 Tenniel's Punch cartoons of the 1857 Sepoy Mutiny led to a surge in the magazine's popularity. Colonial India was time and again caricatured in Punch and can be seen as a significant source for producing knowledge about India (Khanduri 2014). Punch material was collected in book formats from the late nineteenth century, which included Pick of the Punch annuals with cartoons and text features, Punch and the War (a 1941 collection of WWII-related cartoons), and A Big Bowl of Punch – which was republished a number of times. Many Punch cartoonists of the late 20th century published collections of their own, partly based on Punch contributions. Punch magazine ceased publishing in 1992. In early 1996, the Egyptian businessman Mohamed Al-Fayed bought the rights to the name, and Punch was re-launched later that year. It was reported that the magazine was intended to be a spoiler aimed at Private Eye, which had published many items critical of Fayed. The magazine never became profitable in its new incarnation, and at the end of May 2002 it was announced that Punch would once more cease publication. Press reports quoted a loss of £16 million over the six years of publication, with only 6,000 subscribers at the end. Whereas the earlier version of Punch prominently featured the clownish character Punchinello (Punch of Punch and Judy) performing antics on front covers, the resurrected Punch magazine did not use this character, but featured on its weekly covers a photograph of a boxing glove, thus informing its readers that the new magazine intended its name to mean "punch" in the sense of a punch in the eye. In 2004, much of the archive was acquired by the British Library, including the famous Punch table. The long oval Victorian table was used for staff meetings and other occasions, and was brought into the offices sometime around 1855. The wooden surface is scarred with the carved initials of the magazine's longtime writers, artists and editors, as well as six invited "strangers" including James Thurber and Prince Charles. Mark Twain declined the offer, saying that the already-carved initials of William Makepeace Thackeray included his own. Punch gave its name to the Lucknow-based satirical Urdu weekly Awadh Punch (1877–1936), which, in turn, inspired dozens of other "Punch" periodicals in India. University of Pennsylvania humor magazine the Pennsylvania Punch Bowl derived its name from this magazine. Australia's Melbourne Punch was inspired by the London original. Charles Wirgman's Japan Punch (1862–1865, 1865–1887) was based on Punch and went on to inspire elements of modern manga. Prehistoric Peeps, cartoons by Edward Tennyson Reed. ↑ Appelbaum & Kelly 1981, p. 14. ↑ Appelbaum & Kelly 1981, p. 15. 1 2 3 Punch, or the London Charivari (1841-1992) — A British Institution, Philip V. Allingham; Contributing Editor, Victorian Web; Faculty of Education, Lakehead University, Thunder Bay, Ontario. ↑ See Schoch, Richard, Performing Bohemia (2004) (copy downloaded 13 October 2006). ↑ See Altick, Richard. Punch: The Lively Youth of a British Institution, 1841–1851 (Ohio State University Press, 1997), 17. 1 2 3 John Morrish, Paul Bradshaw, Magazine Editing: In Print and Online. Routledge, 2012. ISBN 1136642072 (p.32). ↑ Whack! Whack! Whack! Reborn Punch Pounded Warren Hodge, The New York Times, 18 September 1996. Retrieved 16 March 2013. ↑ "Biography: Clive Collins - The British Cartoon Archive". University of Kent. Retrieved 11 December 2014. ↑ "Noel Ford's Cartoon and Humorous Illustration Portfolio". Ford Cartoons. Retrieved 11 December 2014. ↑ "Biography: Leslie Gilbert Illingworth - The British Cartoon Archive". University of Kent. Retrieved 11 December 2014. ↑ "Biography: John Jensen - The British Cartoon Archive". University of Kent. Retrieved 11 December 2014. ↑ Campbell, Jean (1986). "Benjamin Edwin Minns". Australian Dictionary of Biography. Canberra: Australian National University. Retrieved 5 June 2012. 1 2 "The Correspondence of James McNeill Whistler: Biography of Raven-Hill". University of Glasgow. Retrieved 22 March 2014. ↑ "David Myers Award-winning joke cartoonist". The Independent. 21 June 2007. Archived from the original on 2 January 2008. Retrieved 24 October 2010. Appelbaum, Stanley; Kelly, Richard Michael (1981). Great Drawings and Illustrations from Punch, 1841–1901: 192 Works by Leech, Keene, Du Maurier, May and 21 Others. Courier Dover Publications. ISBN 978-0-486-24110-4. Wikimedia Commons has media related to Punch, or the London Charivari. Beauty's Lisping Parasite, a Punch article decoded. Ariadne In Naxos, a Punch cartoon analyzed.